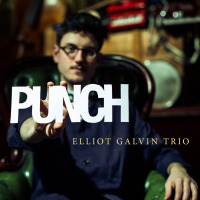 Punch is Elliot Galvin’s second release as a trio with bassist Tom McCredie and Simon Roth (drums, percussion & glockenspiel). Variously annoying, comic, dark and simply brilliant, Elliot’s new CD, his first on Edition Records, is quite something. Ten tracks, a running time of a little over thirty-eight minutes, Punch covers a lot of ground. Perhaps Galvin sees the recording studio as a playground. Forget Lego, the leader prefers to play with a kalimba, a modified melodica, a cassette player (Punch and Judy) and stylophone. Punch and Judy opens the show – the cassette player still has its uses! The music which follows (tracks two and three and five to ten, track four doesn’t count!) features dazzling musicianship, the trio’s command of a kaleidoscopic range of styles defies belief. Their ability to switch from groove to bop to swing at the flick of a switch is truly impressive. Galvin plays accordion on Hurdy-Gurdy, a kalimba on Tipu’s Tiger, on which drummer Simon Roth plays glockenspiel, suggesting they are multi-talented and they are. Hurdy-Gurdy opens with some sparkling piano playing supported by Roth’s super-slick brushes with the band leader introducing his unsettling accordion. Roth maintains the uneasiness with a disturbing, chiming glockenspiel on Tipu’s Tiger. Blop and Lions are at the heart of this new CD. Galvin detuned one of his melodicas by a quartertone (as one does) and goes for it – more Be-Blop than Blop. Rahsaan Roland Kirk would have approved, indeed he would have joined in! Galvin used duct tape to cover the piano strings on Lions as the bop-feel continues. Mack the Knife is as you probably won’t have heard it. The composer would surely recognise, and approve of, Galvin’s treatment as he strips away any care-free saloon bar pastiche and presents a dark reading of a 1930s prescient masterwork. Bassist Tom McCredie is commanding throughout; creative, fully engaged and a reassuring presence. Punch isn’t easy listening, rather, fascinating listening. Hearing the Elliot Galvin Trio live will no doubt reveal more. The album launch is at the Vortex, London on 1st August. The CD Punch by the Elliot Galvin Trio is released on 29th July on Edition Records (EDN 1076).